Today, we can openly talk about developing a “civil religion” in Russia, the “cult of Victory”, combining it with a “new national ideology”, which has been in creation for a long time. In addition, for some “new statists” and part of the Communists, including a more wider context of the “Soviet”, the “USSR-2”, etc, it is almost salvation, while for others, especially the liberals and “diminutive nationalists”, and even the “regionalists” (or separatists, if you like), it causes a difficult storm of emotions. The sympathy for our last world war military and political opponents unites a variety of groups: from liberals to Russian Nazis, from Jewish oligarchs to almost insane anti-Semites. Unfortunately, some of the so-called “white spectrum” joined it, and in our opinion, only pushed the Russian people away from the “white cause”, from sympathy that was more common in the early 1990’s. It should be noted that this is not about the “fascism and anti-fascism” of the National Socialist ideology (that is a special issue), but mostly about the military campaign of Germany in the 1940’s. We should take this into account. Neither “civil society” nor “civil religion” are “from here”, “not ours.” But what is it? And how does it relate to Orthodoxy? As we know, ancient Rome had parallel religious (i.e. related to the other worldly) cults, which carried out the simultaneous protection of the emperor as Pontifex Maximus , the greatest bridge-builder. The adoration of “the genius of the Emperor,” i.e. the “spirit-keeper”, was carried out through burning incense next to his statue. We should note that incense was burned, not through sacrifice (especially of humans), as it is sometimes assumed, and not to the Emperor himself, but only to his “genius.” It has nothing in common with the original form of real ontological “paganism”, i.e. with human sacrifices. In fact, it is quite different from what was carried out by most ancient priests and kings (in fact, not everyone). The actual “cult of Victory” was connected with this cult that actually “lost its features”. The Altar of Victory that was situated in the building of the Senate (Curia) included a golden statue of Victoria with wings and holding a laurel wreath of the winner in her hand. It was placed there by Octavian in 29 BC. The altar was removed from the Curia by Emperor Constantius II in 357, and was returned back by Julian the Apostate and again brought away by Gratian in 382. It was followed by radical changes. In 381, the Emperor Theodosius I the Great (who was the co-ruler in that time) adopted a law depriving the Christian apostate of all civil rights. In 382, Gratian refused his title of Pontifex Maximus. After the death of Gratian, the Rome prefect Quintus Aurelius Symmachus repeatedly asked Valentinian II to restore the altar. His claims faced strong opposition from St. Ambrose, and Symmachus said that the destruction of the Altar of Victory is unjustified barbarity. This altar “is a guarantee of a general agreement and everyone’s loyalty”; it is the guardian of Roman glory and Roman morality. All further claims to restore the altar were rejected, but it was restored by the usurper Eugene during his short reign in 392-394, and then was permanently taken away from the Senate building. Its subsequent fate is unknown. It was more of a symbolic ceremony, not a cult; at least, we do not have any information about the real “killings and resurrection”, or other Roman cults during these times. If they were real, we would have some evidence. The Sophists and Socrates had done their job long time ago, although, the secret mysteries apparently preserved everything. In fact, the Soviet Union was about the same thing. At the same time, the cult’s nature is what is important, and now how its participants explain it. If the Soviet victory in 1945 was explained by the invincibility of communist ideology or “patriotism of the Soviet people” (in some cases, as Stalin said “of the Russians”), then after the rejection of the “Soviet” aspect, and especially after the collapse of the USSR, the renewal of the memory of the Victory’s spiritual side and Stalin’s renewal of the Russian Church’s position and connection of believers’ prayer feat and military achievement began. It remains, and it is right. Moreover, it was the Church’s position that was partly legitimized and still legitimizes Soviet power for many Orthodox believers, contributing ironically to the “bloc of Communists and non-party” (although today both have in some sense “swapped” somehow: the Communist minority is not in power). We must be honest. I personally, definitely have the Orthodox attitude towards the “Great Victory” and can see that not everyone considers it in this way , and I don’t mean the “creative class” and deliberate opposition, but the “moral majority”, “Soviet majority”, which has generally maintained the “Soviet” worldview. For many of them, any revision of the Soviet view is seen as a betrayal. There are a lot of people with this opinion, and, of course, they are in their own way right. During the years of lawlessness, the liberals managed to discredit all the “no Soviet.” Those for whom “the USSR brand” turned into a political business speculate on it (this is a new, but very characteristic phenomenon). There are those who cannot “fit” the tragic antinomies of the Old Testament in Christianity, and therefore move to “new paganism.” There are those who are not ready to accept the ascetic basis of the Church and therefore keenly notice when the Orthodox believers do not respect them, especially clergymen. And there are mere unbelievers (although this is an illusion). But the fact remains: the “immoral minority” mostly wants the “moral majority” to collide with the Church. The last serious attempt was made under Khrushchev and, if he had stayed in power, such most likely would have been successful. Khrushchev, compared to the “1920s intellectual atheists”, relied on “ordinary people.” There are no illusions to be had here. In general, the situation with the “cult of Victory” is reminiscent of the period between the reigns of St. Constantine the Great (306-337) and St. Theodosius the Great (379-384, as co-ruler of Gratian, -395), the last Ruler of the single Empire. He was the first of all the Roman Emperors who didn’t call himself the Pontifex Maximus, and the empire collapsed under him. Without questioning the sanctity of St. Ambrose (that does not depend on political position, but on spiritual feat and gracious gifts), we can ask: was Symmachus politically right, even historically? However, it was the way it was, and the New (Second) Rome, based entirely on strict Christianity, existed for more than a thousand years, as long as an empire “should” exist, according to the theory of historical cycles. And this is without the cult of Victory. Florovsky, whose path is very characteristic, began his scientific and literary works as the Russian Orthodox patriot and member of the Eurasian movement and completed his life as a convinced ecumenist and US policy adherent. The epistemological connection between the “Empire” and the “desert” is easily seen in this case. Florovsky was a supporter of “refined Christianity” and “disliked” the Empire idea. In general, it is a “Judeo“, not “Hellenic-Сhristian” position, although Archpriest Georgy was ethnically Russian. This is the position of “destructive rightness”. The correctness of Archpriest Georgy is possible to be recognized. The Empire was a compromise, especially in such important issues as marriage, family life, and asceticism. There is much historical evidence that the persecution of Christians was not associated with the rejection of “burning incense” to the Emperor, but the refusal (especially of Christian women) of a sexual life, including marriage, which caused irritation of the mad Roman crowd. Yes, when the Empire did not accept this, a large part of bishops agreed with the imperative of body marriage “for the sake of the world”, as “salt began to lose its power.” But the opposite is true too, i.e., consistent “church-going” and the “ascetization” of the Empire. The full transformation into a church with all the consequences would mean its self-destruction. The rightness of Florovsky is dead, even sacrificed. Not only was “compromise” needed, but also “justification of compromise”. As in the USSR, it was necessary for “Suslov’s compromise justification” between “revolutionary” and “real” socialism, and few people except Suslov understood this “guarding dialectic.” Now it does not matter: there is no Soviet Union, and “Marxism-Leninism” is dead. But the combination of “Christian” and “not so Christian” in modern Russian society is extremely important. There were attempts to build New Jerusalem within Moscow: Ivan the Terrible’s Oprichnina Palace. Lightning burned it, but no one was injured. The Tsar realized (he always did understand everything) that construction had stopped. Boris Godunov wanted to rebuild the Kremlin in accordance with the image of Jerusalem; Moscow’s fate in the Time of Troubles is well known. Patriarch Nikon built it near Moscow, but not in Moscow. The situation was complicated by the disastrous reform and “the book reform” - it still opened, but the monastery was built anyway. In the “secular-Soviet”, “lower” context, we can reduce the problem to the concepts of compromise on the one hand, and to utopia on the other. In the Soviet years, shortly before the end of the Soviet Union, the same (although differently interpreted) utopianism would respond to calls to “make Moscow a model communist city” (ironically according to Florovsky). We should return directly to the cult. The Orthodox liturgical is clear now. 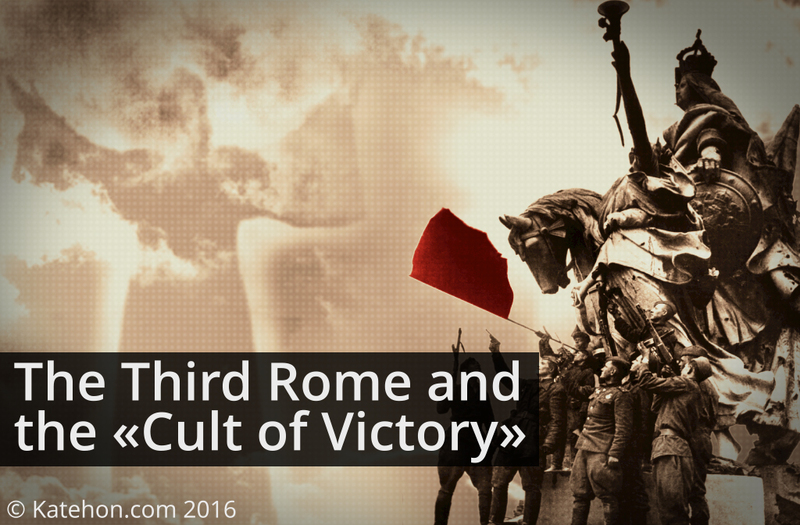 “The cult of Victory”, as it was in Rome, has no real religious activities. If Rome had some parts of it (burning incense, like an image of burning victims), we do not have even that. "The cult of Victory" is sterile. Yes, the “cult of Victory” is a kind of religion (a link between people in this world and the other one) of the “Soviet-national”, “moral majority”, which continues despite the “creative and immoral minority”, to be Soviet (without any assessment). But, unlike the old Roman Christianity and the old Roman “paganism,” Orthodoxy and the “cult of Victory” in the current period of transition of “New Russia” do not contradict each other, as is the case today between Orthodoxy and, for example, “new paganism.” The latter aspires to eventually replace Christianity in the life of Russian people. Moreover, it is ready to become an alternative to the libertarian post-Christian Europe. “The cult of Victory”, however, has no such intentsions. This is a largely spontaneous form of “popular sentiment” that does not coincide completely with the mind of the Church, but also does not contradict it. “The cult of Victory”, which gradually grew in the Soviet Union not without the support of influential military circles, has never been anti-Orthodox (“scientific atheism”) or related to any “burning incense to idols.” We can see anti-Orthodoxy in other Soviet holidays like November 7th, May 1st (“Walpurgis Night”), and March 8th, but not the 9th of May (although the war ended on May 6th in memory of St. George). The church memorial service on Victory Day is not opposed to the state or the purely imperial comprehension of it without affecting Communism or Marxism, as well as being in a “zone of the Year” with Radonitsa and Trinity Saturday. It becomes more obvious nowadays. Yes - New Jerusalem within the boundaries of the Third Rome. Not separated, but not merged. This in fact mirrors how Patriarch Nikon built his project near Moscow. At the same time, we have received a straight answer to the hidden question. Last year's Victory Day showed us just as it should be. We are talking about the appearance, in fact, of the Immortal regiment. The dead came. Themselves. Directly and immediately. Soviet, in fact Russian, atheism was the apophatic theology of Holy Russia. The Soviet apophatic life is How the Steel Was Tempered, and Soviet apophatic theology is the “Earth” by Dovzhenko: “our black earth” on which they dance. But there is no way back to this atheism. Most likely, it was the only epiphany of its kind. Today's atheism, even Nevzorov’s, who is Russian whether he likes it or not (he is “the hero of Dostoevsky” that is perfectly seen “without X-rays”), does not repeat the atheism of the Soviet Union, but is rushing to the libertarian legal West at full steam. But this is “the second death” and not Pavel Korchagin’s. The Russian dead come to visit the Russian living, all “church-going” and not, righteous and sinners! On Russian Victory Day. Thus, we have political-historical conclusions. Victory Day is a celebration of victory, or rather, the victories of past and future, of all the Russian-Slavic world, in Eurasia, over the United Europe – from usurping the Carolingian Empire to the (inevitable) European Union. Yes, the historical image of the victory itself was made from the victory over Hitler. But in all seriousness, this has no relation to the struggle between the two “ideologies of modernity”, fascism and communism. To be more precise, one or the other has a completely different reality, and today it is revealing itself more and more. Those who speak of fascism and communism in relation to Victory Day are either deceived or are deceiving others, even unconsciously. The correlation of Orthodoxy and the cult of Victory present the real situation. By taking part in last year’s “Immortal Regiment” which united the living and dead, the Orthodox, Muslims, Buddhists, “new pagans,” and all the others, including, of course, atheists (who should not be discussed now), the Head of State, the Supreme Ruler, - whether limited or, ideally - the Tsar, the Emperor, here and now revealed himself to be the Pontifex Maximus of Old Rome. After all, in one way or another, the “Immortal Regiment”, including “our dead,” is in fact religious in nature. Faith is approved by the Tsar and through the Tsar. The people are strengthened in their faith by watching the Tsar, his wife, their children. But for now, it is too early to talk about such. The Tsar hasn’t appeared yet. Nevertheless, the participation of the Head of State in “Immortal regiment” and, in fact, his leading of it - at the rank of a colonel! - is the first step towards returning the legitimacy of the Russian government for the first time since February and March 1917. These are the first steps in restoring the state’s multilateral legitimacy - its crystallization, its symphony, its synergy.